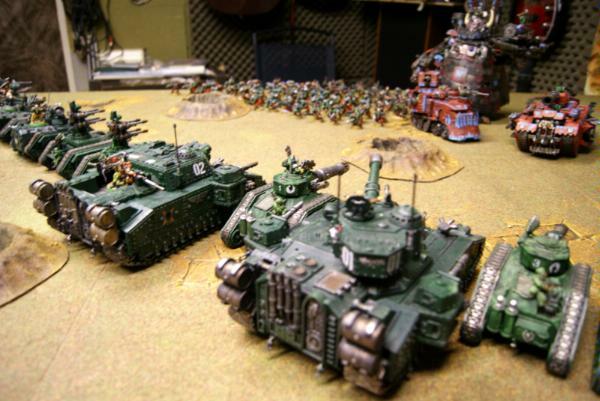 A Black Legion tank commander is navigating his Land Raider through enemy territory. He’s caught in crossfire between two Razorbacks, one left, and one right. Both are at the limit of their weapon range, so the commander decides to rush towards one so that he can’t be hit by both. Should he drive toward the Assault Cannon armed Razorback, or the Lascannon armed Razorback? So, rending against vehicles. You get your usual 1d6 plus weapon strength roll, with the added twist that if you get a 6 on the roll, then you get to roll a d3 and add it to your result. This means that an assault cannon at Str 6 could get a 15 and penetrate a Land Raider (Str6+roll a 6 on d6+ roll a 3 on d3 =15). The question is, can it do a better job than a Lascannon (which is a plain Str 9 + 1d6 with no rending)? It’s a little tricky to do a straight like-for-like comparison here as a key feature of the assault cannon is that it gets four shots, whereas the Lascannon only gets one. So here’s my starting point. I’m assuming that there are no misses, and for the Lascannon I’m looking at the odds of a penetrating hit, and for the assault cannon I’m looking at the odds of at least one penetrating hit. Some of you may object to that approach, but bear with me for now. (Just to note: the gap in the line isn’t a mistake, it’s simply that you can’t get a 12 on the assault cannon as rolling the 6 gets you an extra d3 making you jump from 11 to 13+). 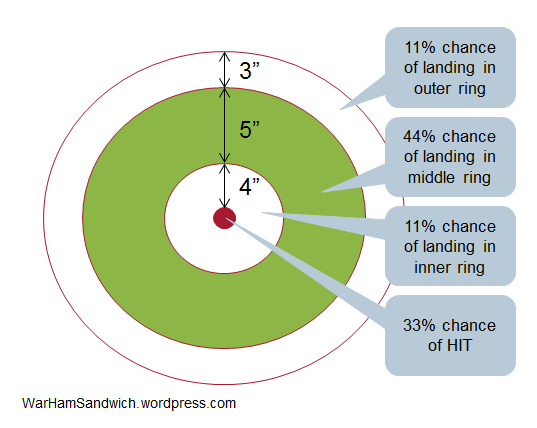 So what have we got: one hit with a lascannon has a (just under) 17% chance of getting a pen on AV14, but 4 hits from an assault cannon gets you (just over) 17% chance of getting one or more penetrating hits on AV14. Okay the odds are only a tiny bit higher but you can get from one to four pens so the net effect can be a lot stronger. So the word on the street is correct, assault cannons are straight up better than lascannons at penetrating AV14? Let’s go back to those assumptions from earlier. None of the shots miss. “So what?” you say, “the assumption was the same for both!“. Actually it’s different. The odds of getting all hits on a one shot weapon are better than the odds of getting all hits on a four shot weapon (assuming equal BS). The analysis above assumes that the Razorbacks never miss, so the more unreliable the firer, the less accurate that graph becomes. 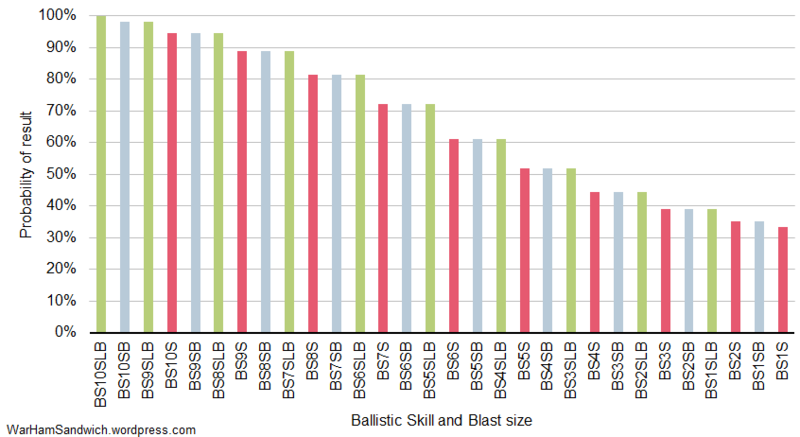 To illustrate the point I’ve run the same analysis showing the results for 4, 3, 2 and 1 hits on the assault cannon versus the lascannon. The comparison is no longer quite so clear cut. We need to account for the end to end process from hitting through to penetrating. So lets’ do that. Lets assume BS4 for the assault cannon and the lascannon. This gives us an 11% probability of success, and since we only get one shot, that’s the total odds. So what’s the final verdict? 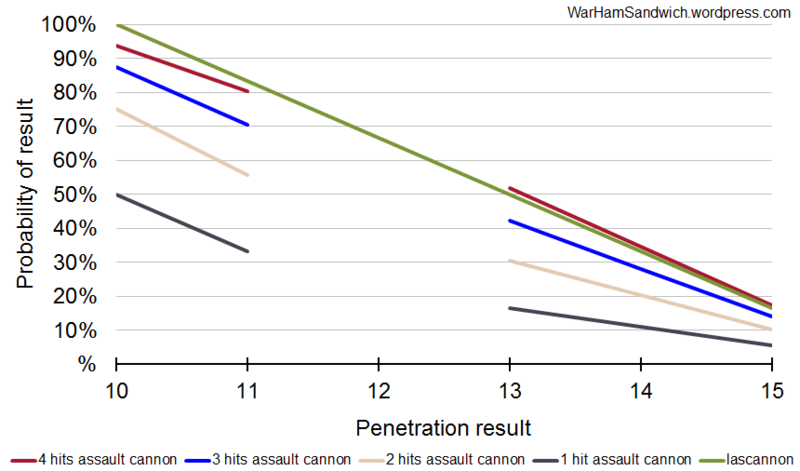 The analysis clearly shows that neither the assault cannn or lascannon are particularly good at killing Land Raiders, but if they both have the same BS, the assault cannon is definitively better. 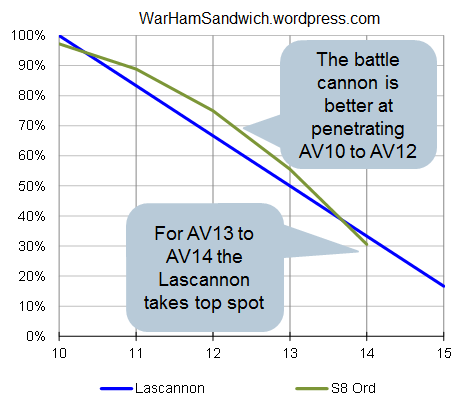 It is worth noting that the lascannon can sneak ahead if fired by a superior marksman, so a BS5 lascannon is equal to a BS4 assault cannon, and a twin linked BS4 lascannon is better than a BS4 assault cannon (vs AV14). I say final verdict, but there’s still a little more gas in the tank. I’ve plotted a couple of different weapons so you can check out the relative merits of weapons that I haven’t covered previously. 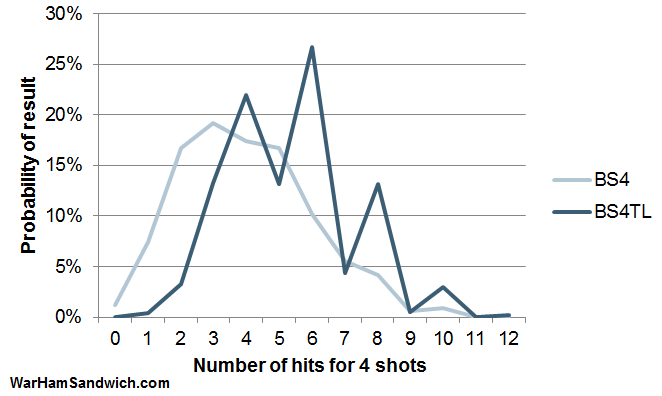 Note that I’ve not done the full end to end calculation here, I’ve simply assumed all shots hit for this chart. One final weirdness I wasn’t quite expecting, against the humble rhino (AV11) the lascannon is more reliable. It’s basically an artifact of the rend: if you get a 6 then your result ‘jumps up’ out of line with the non rending results. So while we initially were concerned only with AV14, we can in fact make a more general statement: AV12 and above, assault cannon more lethal, AV11 and below Lascannon more deadly! Chaos Lord Harleck Wynne faces a wall of Imperial Guard tanks. He has to deepstrike his terminators, as any walking squad or vehicle will be wiped out as it approaches. Where should his combi-melta armed Chaos Terminators be placed to minimise the risk of mishap? Where should they be placed to maximise the chances of getting into melta range? Where should they be placed to get a balanced risk of mishap versus melta range? 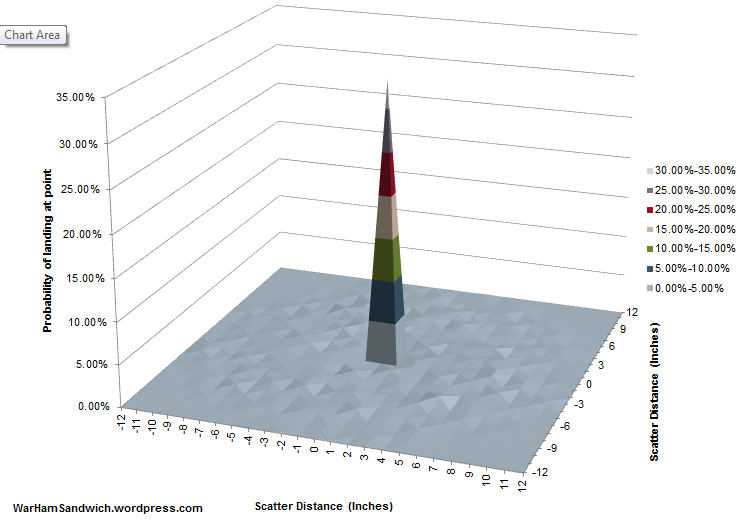 Ok, so deep striking is governed by scatter dice. It’s a 6 sided die with two ‘HIT’ faces, and four faces with an arrow. Place your model where you want him, and roll. If you get a HIT then you land on target, if you get an arrow, then you scatter 2d6 inches away in the direction indicated by the arrow. 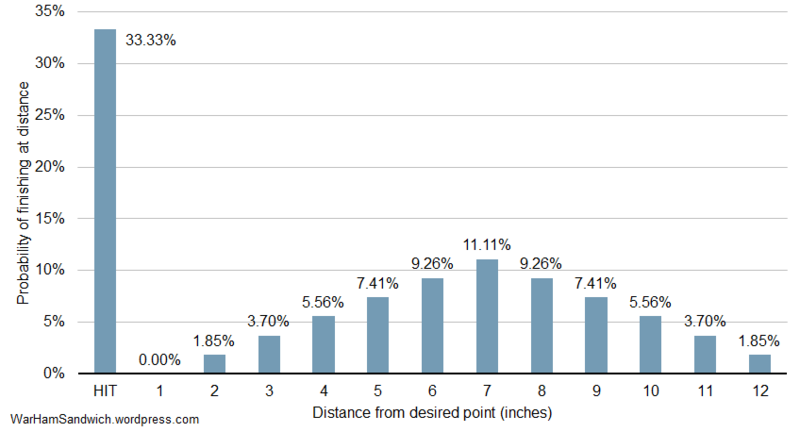 Because the distance is governed by 2d6, the distance follows a pattern already described here such that results of 7″ are the most likely and 2″ and 12″ are the least likely. The arrows complicate matters as they don’t comply with the discrete probability that I normally use for these calculations, but we’ll touch on that later. That was pretty much as far as my analysis went until quite recently. This approach clouded my thinking, as I saw it as a straight up question of distance, so I may as well get super close to the enemy as the ‘most likely’ scatter distance was 7″. Case closed, right? If you don’t get a HIT, then it’s all about the arrows. Let’s imagine a model with a 25mm base put on the table in his desired deepstrike position. 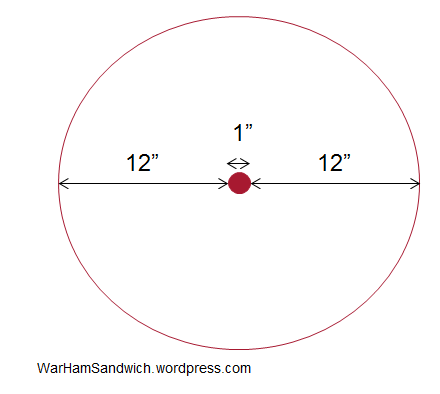 He can scatter up to 12″ in any direction, so lets consider a 25″ wide circle as the total space we could end up in (e.g. up to 12″ to left + 1″base + 12″ to the right gives us the 25″, see below). As you can see in terms of a single point, the target at the centre is far and away the single most likely final destination. In fact the difference is so extreme that all you can see of the scatter is some light ‘fuzz’ in a ring around the centre. So the first point to note is that if you do scatter it would appear that you could end up pretty much anywhere in that 25″ circle we described earlier. But that’s not particularly enlightening, so lets take a closer look at the ‘fuzz’. I now remove the HIT from the chart, and the scale can then be changed to show the variation in odds for the scatter results. It’s worth noting that I didn’t solve this analytically so we don’t get a smooth and pretty set of results, we get a somewhat noisy set of peaks and valleys. But it’s still good enough to gain some insights and is still essentially representative of how it works in reality. So this is a lot of exposition and I haven’t addressed the opening question at all! What about those terminators? Based on the calculations above, I carved out the probability of landing in a ‘safe’ area depending on how far away you place the terminators. But that in isolation is not enough. We want the terminators to land within 6″ of the tanks to get some hot melta goodness going. 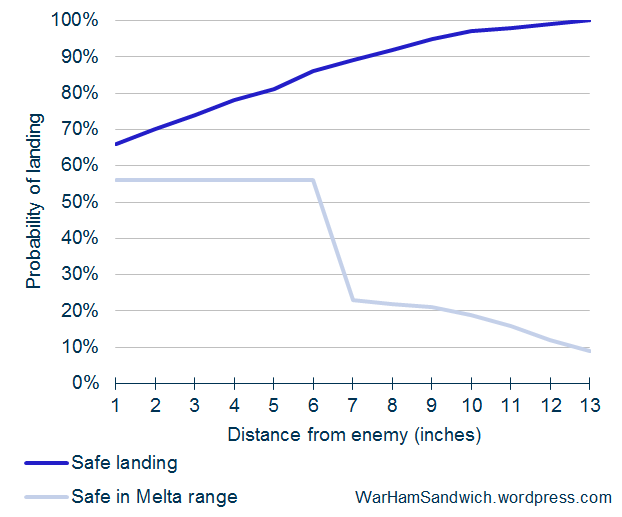 So here I’ve plotted the odds of landing safely for a given distance, and also the odds of ending up safe AND within melta range for a given drop point (i.e. the point you selected to drop at, not where you end up after scattering). 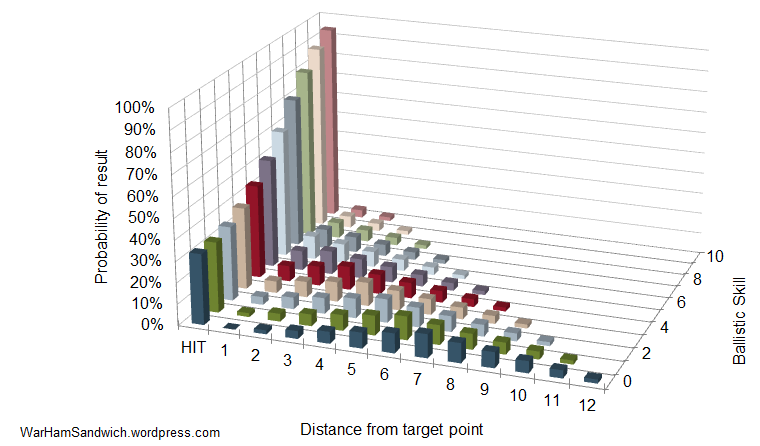 So on this graph the x-axis is the distance from the tank wall you place the model initially, (i.e. before rolling for scatter). The results weren’t quite what I was expecting going in, though do bear in mind that these findings are only true for the specific set up of the question – this graph isn’t a general rule for all deep strike situations! So, what does this show? Well, assuming the parking lot of tanks is the only other unit in the area then unsurprisingly the further away you place them the less likely they are to scatter on to the enemy and mishap. But playing it safe won’t necessarily get you within the all important 6″ melta range. Here’s the interesting bit, I had originally thought that putting the terminators 1″ away from the tanks would get you the highest probability of being in melta range with a trade off of slightly higher odds of mishap. But I was quite wrong. The odds of getting safely in melta range stay pretty flat if you originally place the model between 1″ and 6″ away, but the odds of a mishap are about 45% at 1″ but fall to about 25% at 6″. So the tradeoff I mentioned in my opening question, doesn’t really exist – you can play it (relatively) safe and still go for the close range shot. Lesson learned, drop those terminators about 5 or 6 inches away and you’re playing the right odds. So how about a more general rule of thumb then? This specific case aside, how do we make better deepstriking decisions on the fly? In my opinion, the best general approach is to think in terms of area. Visualise the 25″ circle around any particular drop point (some assistance here and here), and then look at the friendly and enemy units in that circle. Now imagine a 1″ buffer around enemy units, and try to estimate what fraction of the circle’s area is covered by all the units and that buffer. This is key to estimating the risk. I’ve illustrated a few simple examples below; in each case the centre of the circle is where you initially place the model (i.e. 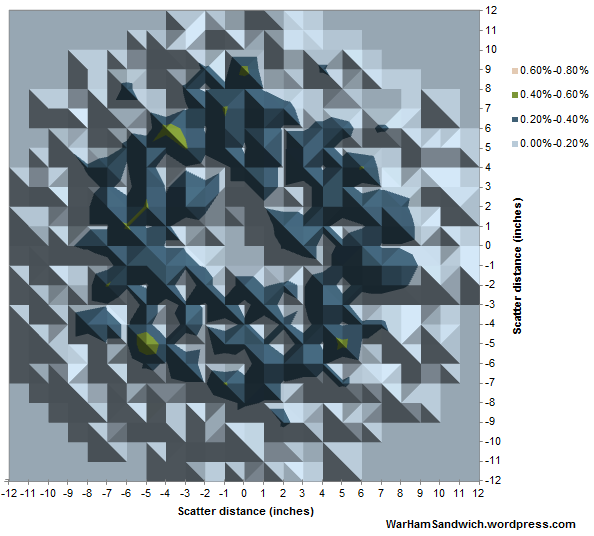 before rolling for scatter), and the red areas have units or other features (such as impassable terrain) that would cause a mishap (don’t forget the 1″ buffer around enemy units!). Do note I’m assuming that the centre point is a legal placement. Also note the maths below isn’t quite exact, but is good enough for tabletop guesstimation. So there you have it – even deep striking right up into someone’s face is not quite as risky as it looks. 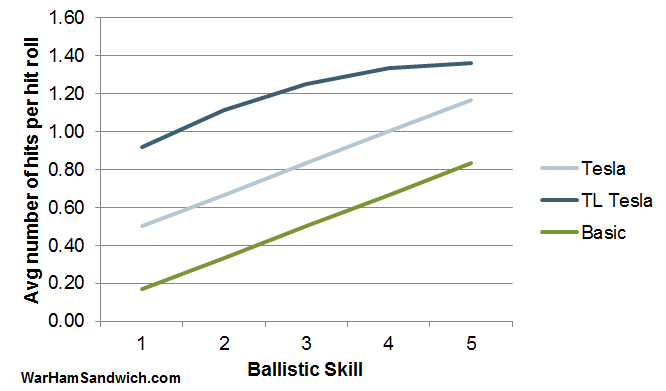 So in a similar fashion to my ultimate Ballistic Skill chart, I took it upon myself to rank the performance of a variety of armour types with rerolls, with Feel No Pain (FNP), and just plain regular saves. This will give some insight into the relative merit of the saving throws we normally encounter in 40k. 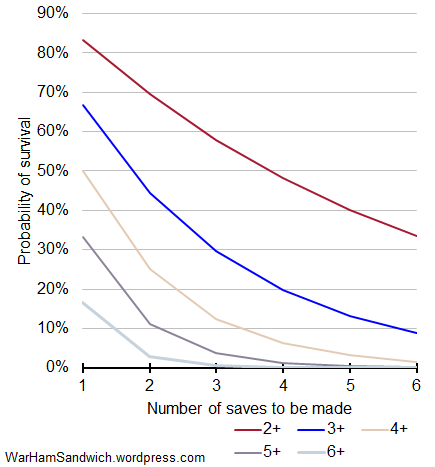 As with Stacking the Odds Part I, the chart shows how likely each type of save is to take no casualties from an increasing number of saves. 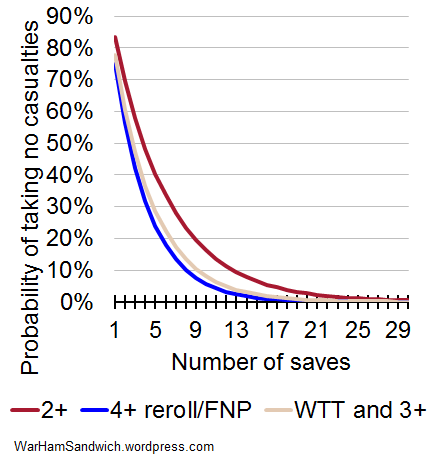 This charts the various types of save (and combinations) showing the odds of taking no casualties for up to 6 saves (I cut it off at 6 as about half of them approach zero at this point). The legend on the right shows the ranking from best to worst with a 2+ rerollable save being the best, and a regular 6+ save being the worst. 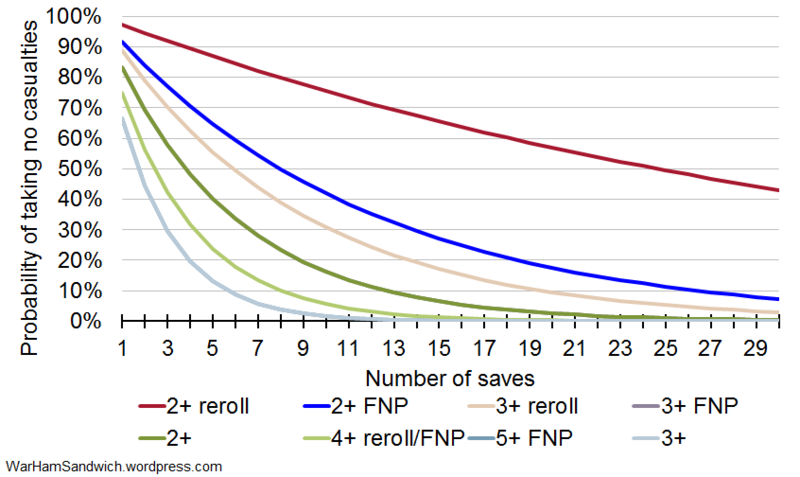 The sharper eyed in the audience may notice that some of the save types listed in the legend don’t show up in the graph – namely “5+ FNP” and “3+ FNP”. Rest assured this isn’t an error, it is simply that they are coincidentally covered by other save types that perform identically. So a 5+ with Feel No Pain save works out the same as a regular 3+ save, and a 3+ with Feel No Pain save works out the same as a regular 2+ save. The calculations are correct, but you need to interpret the data in the context if the game itself. So saving on a 5+ followed by a 4+ for FNP is statistically the same as a 3+, until you get hit by an AP5 or AP4 weapon, at which point all you get is the FNP, which is just a 4+ save (as you can see from the chart is a lot worse than a 3+). The FNP could also be blocked by a high strength AP- weapon, leaving you with just a 5+. In a similar vein, the 3+ with FNP is the same as a 2+, but what if they got hit by a battle cannon? the 3+ is negated by AP3, and (assuming we’re talking about T4 units) the FNP is negated by the instant death rule. So no saves of any kind! But a squad of terminators would still get their 2+ and (assuming that 5 are wounded by the blast) they have a 40% chance of taking no casualties at all! So what about those opening questions? Well Altmann was interested in the effect of FNP on terminators, and to show the difference I’ve scaled the number of saves taken up to 30, and dropped the weaker save types. Joe’s suggestion of the Wolf Tail Talisman (WTT) is charted below. Assuming the squad has power armour, then it works out quite close to (but slightly better than) a 4+ reroll, and worse than a 2+ save. This should let you compare the various save types available to you, but don’t forget the context of how saves and FNP get negated! If there are any other save types you want to see included, then please do leave a comment. This is a topic I touched on briefly before, but I think it’s time for a more comprehensive review. As I’ve said previously, many players have bad instincts for how odds ‘stack up’, and I often hear comments like ‘if a terminator has to make 6 saves, you’d expect one to fail’. Time to challenge some assumptions. A squad of terminators come under bolter fire and have to take 6 saves, what is the probability that they take no casualties? A squad of marines come under a similar hail of bolter fire and also have to take 6 saves, what is the probability that they take no casualties? At tournaments, and during club play, you may often hear cries of consternation as someone can’t believe that their opponent just made X number of saves in a row. I think this ties in to certain types of (erroneous) expectations. Nothing in this game of dice is certain; and you can never get a 100% guarantee of success. That sounds pretty trite, and taken purely at face value, it is. But I’m trying to get at something a little deeper. If a terminator has to make ten saves, or a thousand saves, there is always a chancing of making it, but the odds don’t scale in the way that people expect. Simply put: a thousand bolter shots is not one thousand times more likely to kill a terminator than one bolter shot; nor is ten bolter shots ten times more likely. 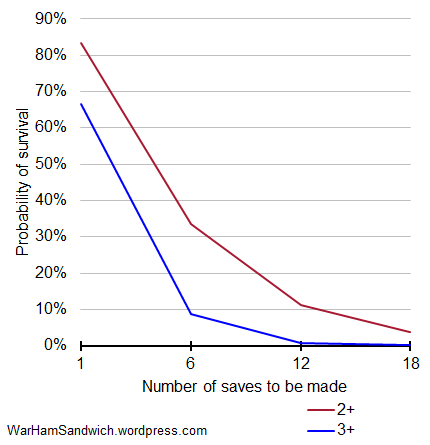 As the number of saves to be taken increases, the odds of survival go down in an exponential way (for the non math types that means they start high, and gradually get lower but never quite reach zero). 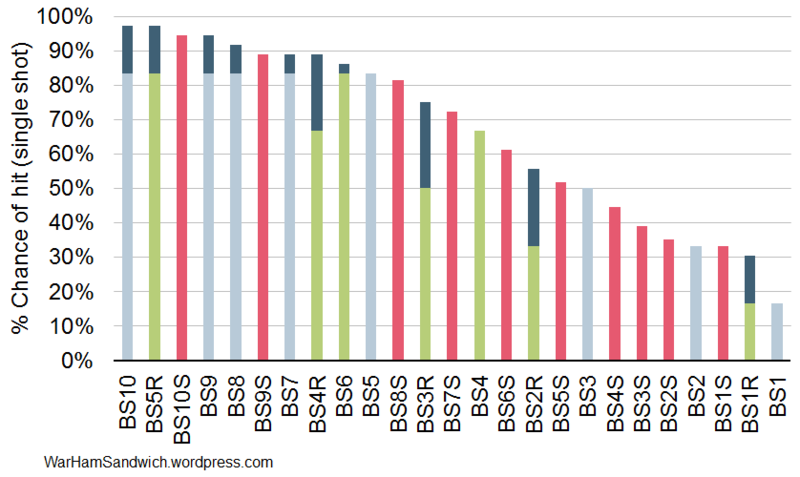 This graph shows how terminator armour and power armour behave as the number of saves to be taken goes up. Terminator saves are in red, and marine saves are in blue. 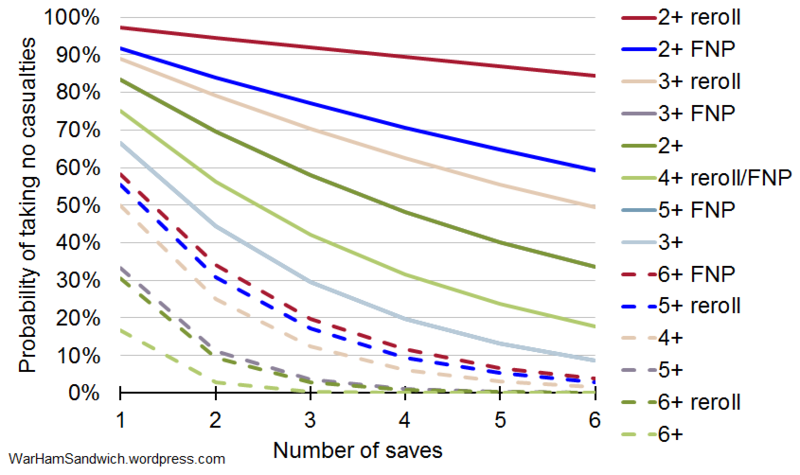 The x-axis represents the number of saves that have to be made, and the y-axis shows the odds of the squad taking no casualties for the corresponding number of saves. So this gives us the answer to the opening question. If the termies have to take 6 saves, then there’s a 33% chance of them taking no casualties (i.e. find 6 on the x-axis and then look at the corresponding point on the y-axis for the red line). The other group aren’t so hot, if the marines have to take 6 saves, then there’s a 9% chance of them taking no casualties. If we extend the analysis a bit, the marines have only a 1% chance of taking no casualties from 12 saves, whereas the terminators have a more respectable 11% chance. Even at 18 saves the terminators still have a 4% chance of walking away without a scratch. Now 4% may sound like very long odds, but in truth its not far off the odds of getting a ‘perils of the warp’ result for a psyker. So not something you’d see a lot, but hardly beyond belief. One (slightly esoteric) point to note is that this is a ‘memoryless’ system. This gets a bit subtle, but what I mean is that the current odds aren’t affected by what happened before. So if a squad of terminators all survived 6 saves last turn and are now facing 6 more saves in this turn, the odds don’t stack to 11% (i.e. for 12 saves), they stay at 33% (for 6 saves). Whatever happened in the past doesn’t affect your current action. Now that we’ve covered some specifics, I’ve taken the liberty to graph the behaviour of saves from 2+ to 6+ when having to make up to 6 saves in one block. Each coloured line represents a corresponding type of save from red for a ‘terminator’ save, blue for power armour, and so on through to the grey line for a 6+ save. Do keep this in mind the next time you fire your hydras at my obliterators! After some poor manouevring by your normally brilliant tank commander, your shiny new Leman Russ gets hit by a Lascannon, and by a Battle Cannon. Which is more likely to penetrate? The ambush continues, and the Russ is hit by a Demolisher Siege Cannon, and a Multimelta at close range. Which of these is more likely to penetrate? 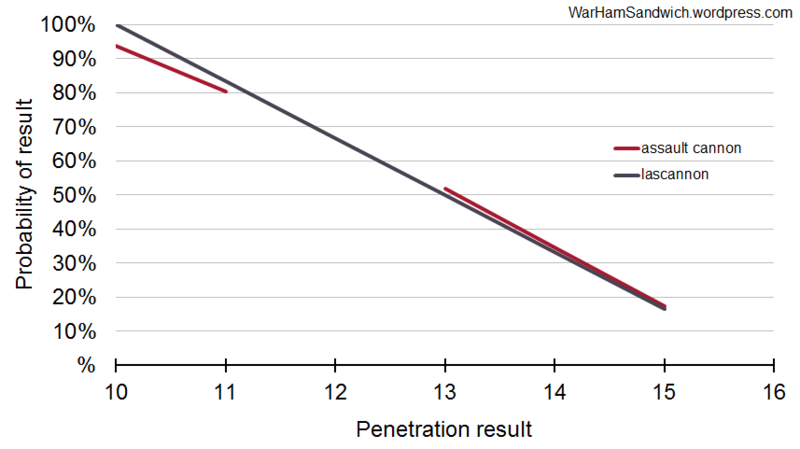 For most weapons, armour penetration is relatively straightforward, i.e. weapon strength + D6. 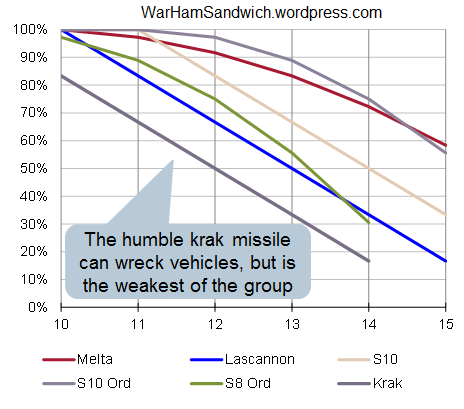 So, for example, a Krak missile can get results from 9 to 14 (not bad against a Rhino, but smacks of desperation against a LandRaider). However many of the best Anti-Vehicle weapons don’t follow such a simple pattern. For example, ordnance weapons roll two dice and pick the highest to add to the weapon strength, and melta weapons at half range get to add 2d6 to the weapon strength. This produces results that aren’t as simple, and can have a couple of quirks. How does this apply to our terrified tank commander? The interesting thing about the opening questions, is that it depends on what side the tank is hit from. 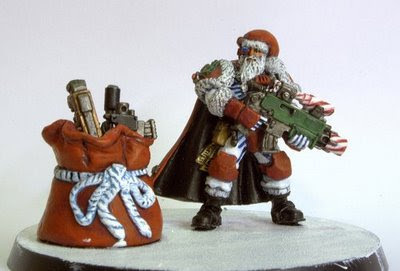 Let’s take the lascannon versus battle cannon first. For a rear shot (AV10) the lascannon is more likely to at least glance, but the battle cannon is more likely to penerate. 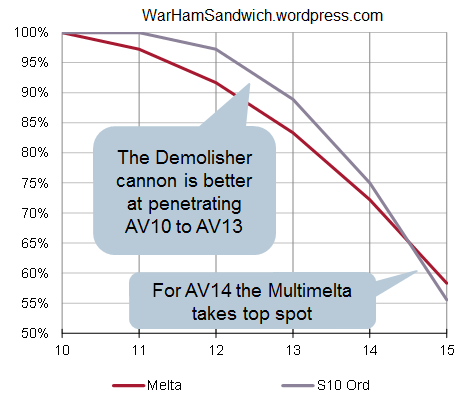 For a side shot (AV13) the battle cannon is more likely to at least glance, but the lascannon is more likely to penetrate. From the front (AV14) the Lascannon is the clear winner and is more likely to glance, and more likely to penetrate. Not that the lascannon is remarkable against AV14 (with <20% chance of penetrating) it’s more that the battlecannon can’t pen Av14 at all! It wouldn’t be a WarHamSandwich without some charts so let’s take a look at the comparison. 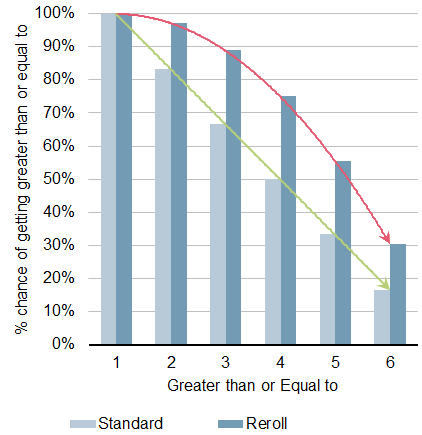 The graph shows the odds of getting at least ‘X’ for an armour penetration roll with each weapon. So to get the odds of penetrating AV13, we look at the 14 result as this gives us the odds of getting at least 14 (the 13 result would get the odds of at least glancing). So we can see a crossover from 10 to 11, and from 13 to 14 where the relative efficacy of each weapon against that AV switches. So what about that second volley of shooting? Again it depends on the angle. The Demolisher is more likely to penetrate against side and rear, but once we get to the front this flips and the multimelta becomes more likely to penetrate. The crossover is clearly shown in the chart, below. So what’s the point Vanessa? There certainly are some comparisons where you can unequivocally say weapon X is better at anti-vehicle than weapon Y, but often it’s not so black and white. With a bit of analysis you can pick the best tool for the job at hand. Here’s a comparison of some of the common anti-vehicle weapons so you can gauge the relative merits against various armour values. A lowly guardsman stands in the open, he faces on one side, the mighty Eldar Phoenix Lord Fuegan Burning Lance (BS7) and on the other side Krazy Kullen (BS4) the weapon operator on a Chaos Rhino. Fuegan’s melta weapon is obviously more potent than Kevin’s twin-linked bolter. But who is more likely to miss? So my earlier treatise on rerolls only considered ‘normal’ rerolls where whatever you needed to get the first time was the same for the reroll. Cunning commenter Caolan pointed out that at very high BS the shooter gets a reroll on a miss, but it’s not the same as the initial roll. So a BS of 6 gets you a hit on a 2+, and a 6+ reroll if you miss; BS7 gets the same 2+ to hit, with a 5+ reroll on a miss; BS8 is 2+ 4+; BS9 is 2+ 3+; and finally BS10 is 2+ 2+. Rather than running the numbers in this post, have a look at my response to his comment at the bottom of this post. But where I took it a step further this time is to calculate the odds to hit for BS1 to BS10 and for BS1 to BS5 with rerolls. 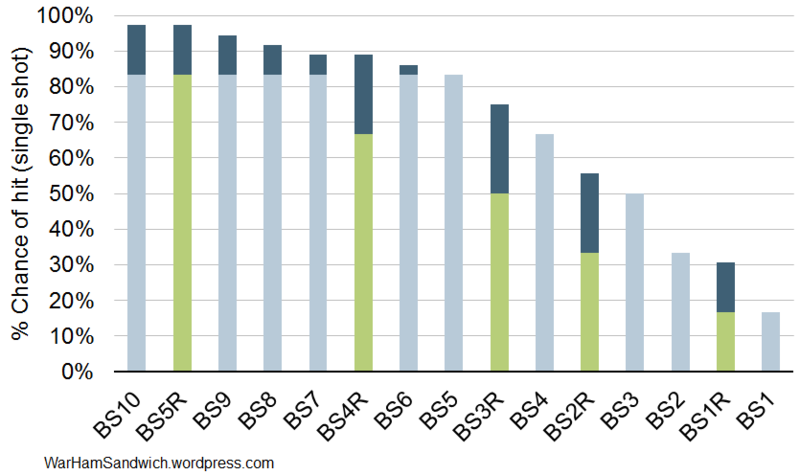 This gives us an interesting ranking of the relative accuracy of the BS values, and the impact of rerolls. I’ve highlighted the rerolls in green to set them apart from the regular BS values. The dark blue is the additional accuracy provided by the reroll (so under the dark blue is the basic odds to hit, the dark blue is the reroll, and the whole bar is the total accuracy). Lo and behold the answer to our starting question appears before our very eyes. It turns out that Eldar Phoenix Lords at BS7, are only as accurate as Chaos Rhinos with BS4 twin-linked bolters. They are equally accurate. Who knew that Krazy Kullen was such a marksman? What really comes through for me is how good BS4 rerolls are. I’m known to have a fondness for Obliterators, and with twin-linked plasma AND melta at BS4 you can really see why. More generally we can see that a reroll is better than a 1 point improvement (or more!) in BS for all cases except BS1 – but I think that’s a fairly well known thing already. That said, you now have the definitive list from BS10 to 1 with rerolls, use it well my friends.